Mahatma Gandhi Institute of Medical Science Wardha: The medical college is among some institutions which come into existent before independence in India as a hospital and later transformed itself as a medical institution in the country and today it is among some of the best medical institutions in the country and providing best medical facilities as well as best medical and dental graduates to the country. It is a first rural medical college in India. The college was started in the year 1969 and the first batch only consisted of 60 students in MBBS and now more than 2300 doctors are already groomed by the medical college. There were 15 beds in the hospital at that time and now there are 974 beds for the people and they provide best medical facility to the people of the state. Earlier it was managed by the Kasturba Health Society and was affiliated by the University of Nagpur (1969 to 1997) and after some time in 1998, it was affiliated by the University of Maharashtra health sciences, Nashik. The MGIMS offer courses in the medical and dental at UG and PG level program and there are more than 20 plus subject in which candidate can look to do their PG course. Every year many candidates file the application form to get admission in the college, but institute only gives admission as per the guidelines of NEET UG and PG. Here you can see a point to point detail of Mahatma Gandhi Institute of Medical Science for better understanding. This medical college every year take an intake of students in the undergraduate course around 100 and every year only those fortunate students are selected who have good performance in NEET UG examination. The fees for the MBBS is Rs 5,56,222 per year. The fees for the MD is Rs 87,567 per year. The fees for M.S is Rs 87,567 per year. The fees for BDS is Rs 1,90,200 per year. NEET stands for (National Eligibility Entrance Test). It for the students who want to pursue medical and dental. The students have to clear this examination with a good percentile and rank to get the admission in the best medical college in the country. 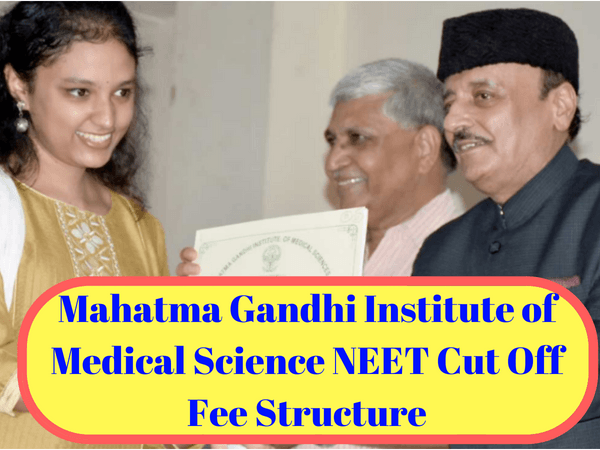 The NEET is organized every year by the CBSE and they are liable for a smooth functioning of the examination in the country and they also issue the ranking for all medical institution and the admit card for the candidate. The student must be an India citizen. The minimum age for the student is 17 years. Necessary qualification is class 12th from a recognized board and school in the state or in the country. Minimum percentage required is 50% and the student must have physics chemistry and biology in class 12th. It is important for the student to have Aadhar card. The student must carry his/her admit card and hall ticket on the date of examination because the student will not be allowed in the examination centre if he/she does not have these two documents. The MGIMS has also given admission to the student who has performed well in the exam and has god ranking in ‘’All India Ranking’’ and in state ranking. In MGIMS the students get the admission based on cut off list declare by the NEET on the official website. The conducting Board for the examination is Central Board of Secondary Education(CBSE), the board is also responsible for issuing admit card to the candidates and has the right to declare the results on its official website. On 6th May 2018, the NEET examination will be conducted, and the results will be declared on the 5th of June 2018. The cut of the list will be declared in the two formats for the student one is All India Quotas and other is State ranking. The exact numbers and marks for NEET 2017 can be seen here to know the difference. We wish you all the best for the exam/result….